Vitamin A is essential for skin health. It increases cell turnover, exfoliates and refines the skin, repairs DNA damage, assists in deep delivery of nutrients, brightens and lightens, strengthens the skins barrier, and is a potent antioxidant. 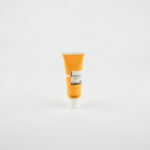 This serum combines high strength Vitamin A (Retinol) with calming, soothing antioxidants for change without trauma. Not for thin, reactive rosacea skin types to begin. Dispense 1 metered dose and gently smooth over the skin, avoiding the eye area. To be used every 3rd night to begin, and gradually increasing to nightly use.